Looking down from the Parc du Chateau on the French Riviera you can see for miles along the beautiful beaches in the city of Nice in the Provence, France in Europe. The rich blue-green hue of the water on the French Riviera in the Provence, France where the Mediterranean sea laps up on the beaches is any tourists paradise. The beaches stretch for miles along the city of Nice on the French Riviera where tourists flock to every year for some suntanning, relaxation and outdoor activity.The city of Nice in the Provence, France has more to offer than just the luxurious beaches. There is multiple shops, excellent dining facilities, elegant hotels as well as the famous flower market, museums, ancient ruins, cathedrals and the list goes on.Nice is a wonderful French Riviera city and it is an ideal travel destination for couples, honeymooners and sun worshipers. You can enjoy yourself on the public beaches on the French Riviera or try one of the public beaches which may cost you a pretty penny by the time the end of the day rolls around. City of Nice waterfront seen from the Parc du Chateau, Riviera, Provence, Cote d'Azur, France, Europe. 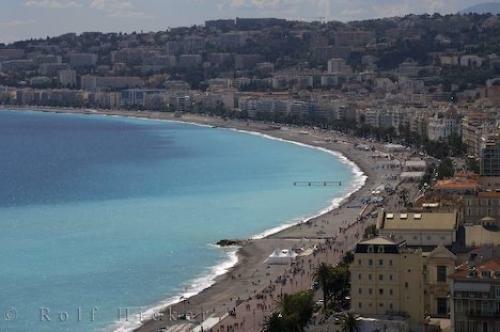 Photo of one of the popular beaches in the French Riviera in the city of Nice, France.